Setting up your camp kitchen, part 1. To make your meals, you will want to set up a camp kitchen. Assuming you want to eat something more than reconstituted freeze dried backpacking meals and instant oatmeal, or hot dogs and marshmallows cooked on a stick over a fire, this will take a bit of equipment. We will lay out what we use, what is optional,a nd what is a real msut have. What can be substituted if possible. Camp Kitchen. We use the Coleman Pack-A-Way camp kitchen. It is smaller and lighter than several of its competitors, lacking a few of the luxuries the others offer in favor of a more manageable package. If you can rely on say the tailgate of a pickup, or wherever you are camping having a picnic table you can use, you can omit the camp kitchen and use something like the Coleman Stove Utensil rack. Of course a camp stove is a must have piece of equipment for your trips. We personally prefer liquid fuel stoves. Specifically the dual fuel stoves. We love the ability to run our stove on the same fuel as our vehicles use. 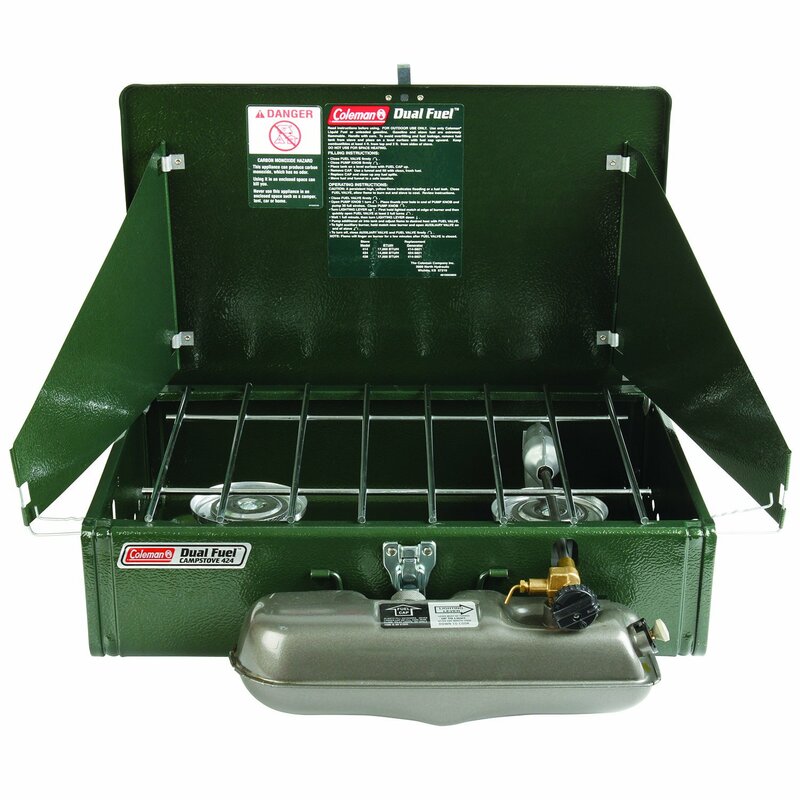 The Coleman 424 Dual Fuel 2 burner camp stove. It uses either Coleman White gas / Ozark Trail Camp Fuel, or unleaded gasoline. Aside from the common fuel, liquid fuels, specifically the White Gas, well a gallon of white gas, or unleaded gasoline has the total full on burn time of 4.5 to 5 of those green 1LB propane cylinders. Make no mistake, a 1LB propane cylinder when used up is still considered hazardous waste, And the cost difference over the long run, a liquid fuel stove pays for itself easily Combine that was the fact that liquid fuels will pressurize and work in conditions that a propane stove simply can not like sub freezing conditions. Something to consider if you are using your stove for winter hunting trips. You will of course want cookware. There are a couple of schools of thought to this. Stainless Steel sets with copper bottoms are durable and work well. We have one, an Ozark Trail set that is just a rebadged TexSport, it works great, but has problems with heating evenly. If you want even heating, the only real way to accomplish that is with cast iron cookware. I highly recommend if you are going to buy new cast iron cookware, that you buy non seasoned cookwae. Doing so will teach you how to properly maintain cast iron. You will want a dutch oven, a skillet / fry pan, and a sauce pan. A lid lifter is a life saver as well. A very much optional item, but highly recommended is a griddle. And take our word for it, you want cast iron on that. The reasons are that you can cook LOTS of pancakes, eggs and bacon on a griddle super easy. We love ours. 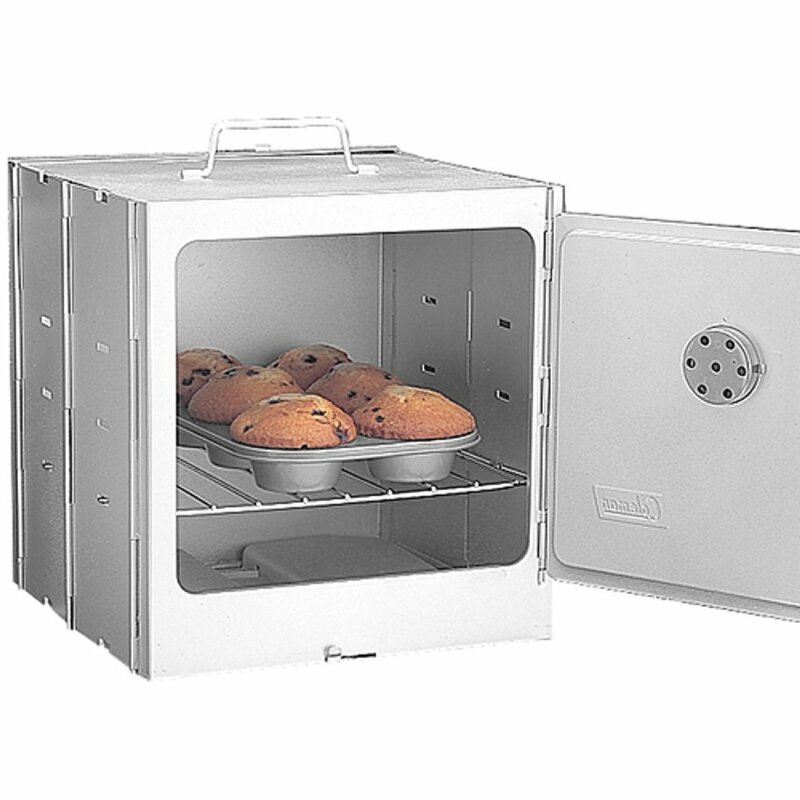 Food storage is critical for any sort of home cooking while camping. A quality cooler is a must. Now most of us can't really afford the Yeti type coolers, And the physical size of them compared to the actual storage capacity, they really aren't at least to us, all that appealing. We have found for long weekend camping, a 50 - 60 quart cooler is ideal. The trick is to get one of those "5 day" coolers that will keep block ice, well, ice for 5 days. There are 2 that are our favorites. The Colmean Extreme 50 quart wheeled cooler, and the Igloo MaxCold Roller Cooler 60QT. The main difference, aside from the 10QT diference in capacity, is the physical format, The coleman is more cube shaped, and the wheels are along the "wide side", it rolls much like a suitcase. The Igloo we favor though. It holds ice a little bit better, rolls easier, and the handle is easier to deal with where it is just a simple swing up handle. With either, we simply take empty 1L plastic water bottles, press a little bit of air / water out so that the sides are slightly sucked in and then freeze them solid. We usually use 10 of them. Simply toss them in when you load the cooler, and you are good to go. No soaking wet of the ice on your food containers! I won't provide links, but food storage containers, the plastic or glass ones with air tight lids Square ones use space much better than round ones. Keep everything air, and liquid tight! Cutting board, and knives. Another no links. Pick your favorites, just make sure that your knives are kept in a knife roll so that they transport and sstore safely. There's more to come, but this is going to be a long read. Stick with us and enjoy the list! Cooking well. Low carb pizzas in camp. So you are camping enthusiasts like us that need to lose weight. You know getting out in the back country gets you active up and around in beautiful surroundings to the point you are getting a workout in without even noticing it. All that extra excersize doesn't mean you can eat whatever you want and still expect to lose weight. I know, I tried that route. It doesn't work. So with the advice of my doctor, and nutritionist, and mind you I am NOT offering up medical advice, just telling you what is working for me. I don't know about you, But I LOVE Pizza. Particularly ham, pineapple, red onion, and bell pepper. If I can add sun dried tomatoes all the better! But that tends to be heavy in carbs and fat. So I worked up a recipe that is hard to beat that can be done in a Coleman camp oven. (I'd love to do the cauliflower crust but the camp oven doesn't get hot enough...). Dual burner camp stove. I use a Coleman 424 Dual fuel. Fuel for your stove. If using liquid fuel a funnel / filter for that fuel as well. If using propane, make sure your stove is compatible with your fuel source. I.E. the Brinkmann 2 burner stainless steel camp stove will be overpressured and damaged bu connecting to a 20lb cylinder. Use only the green small cylinders. Coleman Camp Oven. There are others, I use the Coleman because, well I have it, and like the way it works. Hot pad for removing / adding to the oven. You will need the following ingredients. (We prefer organics, make your own choices) Prep ahead of time unless you are long term camping such as Full time nomads, and long hunting trips. 1/2 cup of 50/50 mix of 2% shredded Mozerella 2% shredded medium cheddar. Italian sausage crumbles pre cooked. sliced cooked ham or better yet, Canadian Bacon if you can get it. Pre heat and stabilize your stove / and oven to 350 degrees F. Place your rack in the middle position. If you are lucky enough to have 2 racks, place one middle, 1 top. Pour tomato sauce into mixing bowl. Add 1 tbsp Italian Seasoning, and a pinch of garlic powder. Mix thoroughly. Tear off a piece of aluminum foil sized to the rack of your oven. Do not block the airflow all the way though. Allow about 1" from the sides. Place tortilla on the foil, spread your tomato / pizza sauce like a regular pizza, and add a thin layer of cheese. Add your toppings, and another layer of cheese. The sandwich of melted cheese when you are done helps keep the toppings from falling off. Place your pizza(s) in the oven and cook for 15-20 minutes until the cheese is thoroughly melted and the toppings are hot. Repeat as your dietary requirements see fit. Serve with a Cesar salad. If you don't already have the gear, here are some links for the major pieces of gear. Purchasing from Amazon through our links helps support our efforts. We really appreciate it. The camp stove we use mostly is our Coleman 424 Dual Fuel. It is far more fuel efficient than a propane stove and shares a common fuel with our vehicles (regular unleaded gasoline). The Coleman Camp oven is a great, easily collapsible piece of equipment that makes low carb / paleo cooking in camp MUCH more like cooking at home.